It's hard to believe that summer is bolting past...literally bolting. It has been a bit of an erratic one -- either very hot and humid (90s were not unusual and more expected this week) or raining. Only in the past few days have we had some heavenly days with warm, sunny weather and lovely cool evenings - great for sleeping after some pretty uncomfortable nights in the past month or two. August always brings me to one of my most happy places in the world (that is not my home) and it is located not far from me in Saratoga Springs. As a horse person, I grew up going to the races there in August from the time I was about 7 years old. (I began riding at age 9.) Over the past several decades since my early years at the track, the racing season there has been extended from just 24 days in August to 40 racing days over six weeks from mid-July through Labor Day. And what was, in my childhood, a popular attraction has since become a massive one, attracting upwards of 25,000 people to enjoy the races on an average day, to a maximum of 50,000 on it's biggest racing day, Travers Stakes Day, which is usually the next-to-last Saturday of the meeting. The Courtyard Garden at the National Museum of Racing and Hall of Fame located on Union Avenue - a beautiful tree-lined boulevard that separates the main race course grandstand and grounds from its Oklahoma Training Track. This "vest-pocket" dedicated space, just east of the museum's main entrance, is on the east side of the building and is defined by a low iron fence that encloses this tiny garden's perimeter. An inviting oasis along Union Avenue with its bubbling tiered fountain, the garden is a delightful haven away from the fray just beyond its soothing environs. One of the featured elements within the garden is the large, historic wrought iron gate from legendary Pimlico Race Course in Baltimore, Maryland - home of the second jewel in racing's "Triple Crown" - the Preakness Stakes. This elegant and elaborate gate dates to 1870, when Pimlico was built, and it stood there until 1966 when a fire destroyed the clubhouse nearby. Just a short stroll to the east of the museum is the Oklahoma Training Track. A special favorite place and time of day are the early morning hours at the aforementioned Oklahoma Training Track that is near (across the street) the main race course. This training facility is called "Oklahoma" for its "far-flung" distance from the main track. It's actually nearby, but for some - probably those who had to walked from the backstretch of the main track to one of to the barn areas at the training track - which can take a good 20-30 minutes, depending on one's pace - must have seemed as far away as Oklahoma is from New York state many years ago...and the name stuck. The newer Whitney Viewing Stand is modeled after a traditional "judge's viewing stand" where race track officials once stood overlooking the main race track in the era long before cameras and digital video. The original viewing stand is long gone (though the track still employs patrol judges stationed at stands - elevated platforms - at points around the race track, along with an array of cameras recording the action during each race, to ensure that the sport is conducted fairly and in accordance with the rules of racing. The Whitney Viewing Stand is hard to miss - it stands high above most of the buildings and barns nearby that house horses, stable staff and maintenance facilities for the race courses, designed in the style of the distinctive Victorian architecture that characterizes the main race course. Training at Oklahoma occurs from mid-April to mid-November and is open to the public at no charge on weekends only during the "shoulder seasons" when the race meeting is not operating (usually from 8-10am, but they'll usually let you in a little earlier). During the racing season (mid-late July through Labor Day), the Oklahoma track is open on racing days (Wednesday through Monday). Even if you're not in the area during the racing season, if you're nearby on a weekend, make the effort to get up early and check out the scene at the training track...it's a fascinating place! 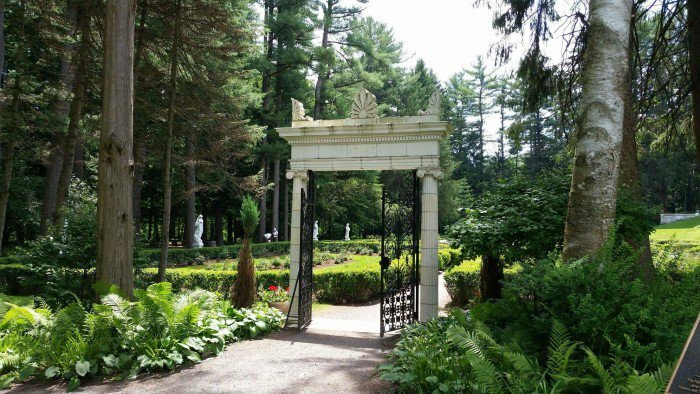 If you're ready to move on, a short stroll (less than a mile) to the east is the rose garden at the renowned artists' retreat known as "Yaddo." Established at the historic property built by financier Spencer Trask in the late 1800s. Many a celebrated writer and artist have spent periods of productive time in the quiet idyllic surroundings of thie beautiful estate. Although the main buildings are not open to the public, the adjacent rose garden is open daily from dawn until dusk and, as with the other sites mentioned above, there is no admission cost to visit them. Thanks so much for stopping by...if you found something enjoyable, please do leave a comment - a personal little calling card to let me know you were here. 2009-2019 Country Contemporary. The original content on these pages, including text and images, are the sole property of the author and may not be reproduced in any manner without consent. All Rights Reserved.